Vittoria has finally released the second generation of their very popular Corsa tires in March 2019. The first generation Corsa, now called G1 was released in early 2016 and has been very popular since then, especially for its suppleness, low rolling resistance and tanned sidewall colors. I’m sure you’ve seen many of them around. 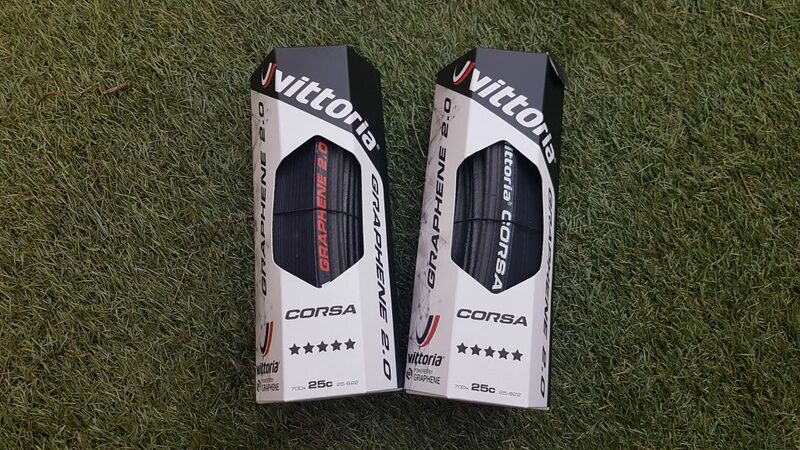 The Vittoria Corsa is a proven racing tire with 7 of the 18 World Tour teams running them in 2019. As for the G2, the main talking point is the new Graphene 2.0 compound and the availability of the tubeless ready version. 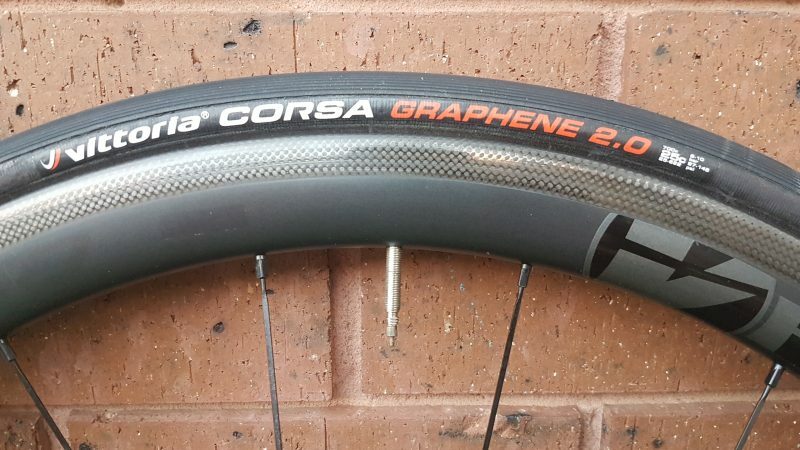 Along with the Corsa, the Corsa Control (for wet weather and used in Paris Roubaix) and Corsa Speed (for time trials) also feature the Graphene 2.0 compound. But first, what exactly is Graphene? It was discovered by Andre Geim and Konstantin Novoselov, who both won the Nobel Prize in Physics 2010 for their work on Graphene. Here’s what the Nobel Prize website says about Graphene. In simple terms, Graphene is a material that is much thinner than paper, yet way stronger steel. Today, Graphene is used in many items found at home; from batteries, computer chips, capacitors, water filters, touchscreens to bike tires. Yes bike tires like the Corsa G2. 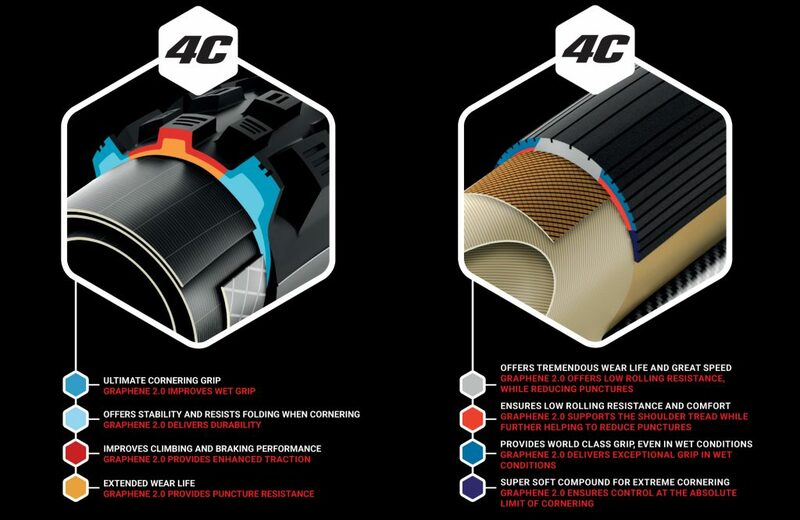 The Corsa G2 is made up of 4 different compound layers, in which Vittoria calls the 4C. Within each layer, Graphene is inserted so that it fills in the spaces between the rubber molecules to improve the tire strength and durability. In fact, the Vittoria calls the Graphene used in the Corsa G2, Graphene 2.0, which is the improved version over its predecessor. In other words, Vittoria specifically tweaked the each compound to achieve the ideal balance between durability, puncture resistance and lower rolling resistance. 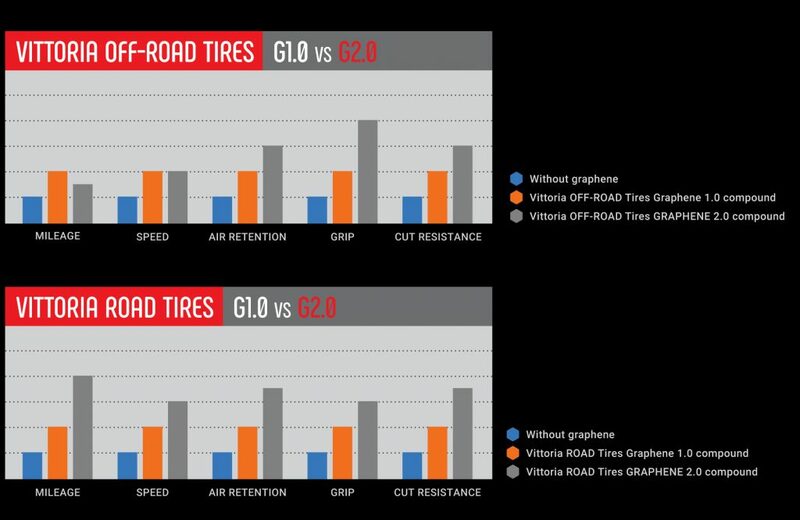 As you can see from the charts above, Vittoria claims that the Graphene 2.0 offers 40% reduced rolling resistance, 30% improved grip and 40% improved durability. These are big claims and there’s no way to verify them accurately. From experience, I can only take these figures at face value. The first thing you’ll notice is the brand new packaging. The base color of the box has gone from black to white, probably to stand out from their competitors when displayed on the shelves. Upon unboxing, you’ll quickly notice the big red Graphene 2.0 wording printed on the sidewalls. Other than that, everything else looks the same as the Corsa G1. The tire threads and grooves remain the same. Installing the tires is as straight forward as it can get. It’s pretty much the same as other clincher tires. It took a little bit of effort towards the end and with the help of tire levers to seat the tires into the rims. For some, tubeless tires have a bad reputation of being hard to seat. But this is not the case here. With its predecessor, the G1, I can seat a new pair of tires without using tire levers. Also keep in mind that new tires are generally harder to seat because they’re not stretched yet (similar to tubulars). You’ll notice that they get easier after you’ve done 500 to 1000km on it. Since then, I’ve clocked 1,000km on them around the roads of Melbourne; from the flats along Beach Road to the hills around Mount Dandenong and Yarra Valley. They performed as expected from a top of the line racing tires; fast and smooth on the flats and plenty of grip during descends. One thing that stood out for me is the G2 is noticeably quieter (less humming sound) than its predecessor, which is something that I really appreciate. I’ve also been puncture-free throughout this period. In fact I’ve been puncture-free for the past 12 months thanks to the ideal road conditions in Melbourne. Having said that, I do have a habit of checking my tires every week to remove any debris caught in it. The Vittoria Corsa G2 tend to pick up more debris, so this is something that you should be aware of. After 1,000km, the tires haven’t show any obvious signs of wear except for a few tiny cuts and grazes. My last pair of Corsa G1 and Corsa Control lasted me 3,000km before starting to show any signs of wear. By 6,000km, it’s was time for a new pair. So with the Corsa G2, I’d expect to be able to do similar mileage, if not more. Keeping up with the industry trends, the Vittoria Corsa G2 is now available in tubeless ready (TLR) version, in addition to the standard clinchers and tubulars. The tubeless ready version is available in 25c, 28c. If you’re looking to run a tubeless, tan sidewall set up, you’re out of luck. The tubeless ready version is only available in black color. Besides, that, Vittoria has plans to make the 30c available in both tubular and clincher in the near future. You want a very supple and fast tire which rides like a tubular. In addition to that, the tan sidewall will definitely make your bike to stand out from the bunch.